Wharton Club Members & Guests Invited - Sign up NOW, as this will sell out quickly. Sign up NOW, as this will sell out quickly! This is a ticketed event. THIS will sell out quickly, as noted when we still had tickets. Hors d’oeuvres start at 6:30pm; dinner at 7:00pm. The five-course meal will be from her popular recipes. Single tickets are $95; couple tickets are $180, including all courses, beverages, tax, gratuity. A copy of the Georgian Feast cookbook (one per individual person/couple) is included in the price. 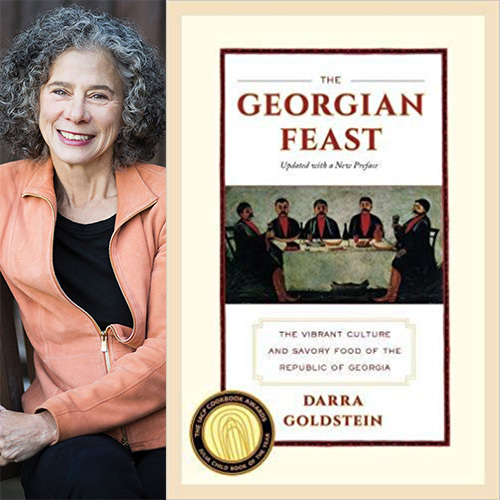 Darra Goldstein is the Willcox B. and Harriet M. Adsit Professor of Russian, Emerita at Williams College and Founding Editor of Gastronomica: The Journal of Food and Culture, named the 2012 Publication of the Year by the James Beard Foundation. She has published widely on literature, culture, art, and cuisine and has organized several exhibitions, including Feeding Desire: Design and the Tools of the Table, 1500-2005, at the Cooper-Hewitt, National Design Museum. In addition to serving as Editor-in-Chief of the James Beard-nominated Oxford Companion to Sugar and Sweets, she is the author of five award-winning cookbooks: A Taste of Russia, The Georgian Feast (the 1994 IACP Cookbook of the Year), The Winter Vegetarian, Baking Boot Camp at the CIA, and Fire and Ice: Classic Nordic Cooking. Goldstein has consulted for the Council of Europe on ways to use food to promote tolerance and diversity, and under her editorship Culinary Cultures of Europe: Identity, Diversity and Dialogue was published in 2005. Goldstein is currently Series Editor of California Studies in Food and Culture (University of California Press). In 2013 she was named Distinguished Fellow in Food Studies at the Jackman Humanities Institute, University of Toronto, and in 2016 held the Macgeorge Fellowship at the University of Melbourne. Hors d’oeuvres will be served at 6:30pm with dinner following at 7pm. The cost is $95 for individual tickets, with a $10 discount when purchasing two of the "Couples Discount" tickets. Wines will be paired with every course; the exact vintner to be determined. A copy of, “The Georgian Feast: The Vibrant Culture and Savory Food of the Republic of Georgia” is included with individual tickets and one shared copy for couples tickets. The complete menu is listed below. Dishes will be paired with appropriate drinks. Limited number of places, and will sell out quickly at these great prices!